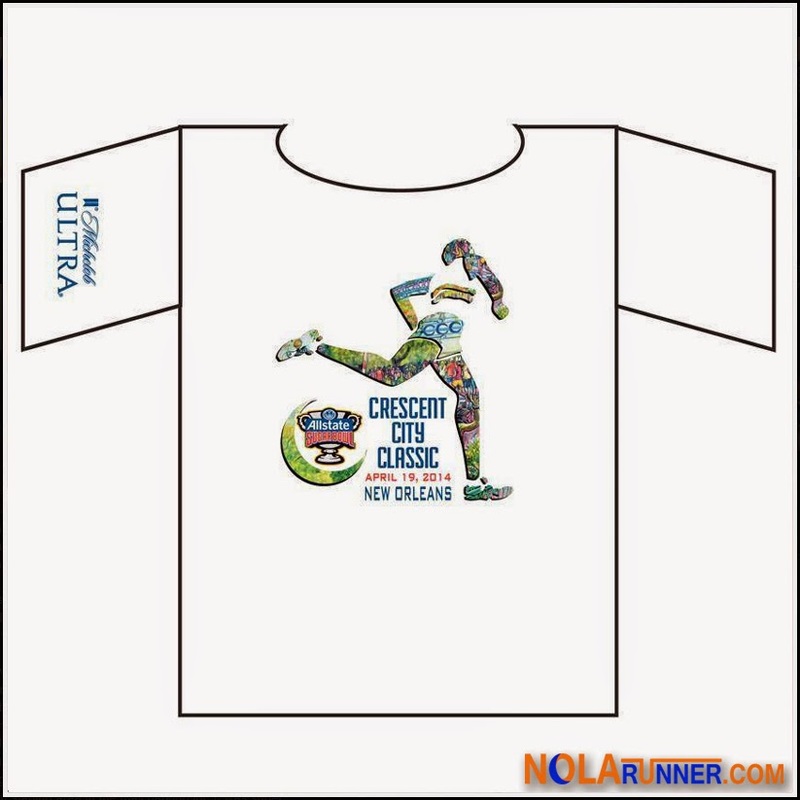 We're less than two days away from the start of the 2014 Allstate Sugar Bowl Crescent City Classic 10K, the premiere road race of spring in New Orleans. Before you arrive at the start on Saturday morning, here's a rundown of all the things that you need to know to make the race a great experience! The CCC10K Health and Fitness Expo opens this morning in halls A & B of the Hyatt Regency New Orleans (601 Loyola Avenue). There will be 2-hour discounted parking for CCC10K participants at the 1303 Girod Street garage or 1-hour parking in the lot at 501 Loyola, both for $5. You must present bib number upon exiting to receive the $5 discounted rate! The Champions Square Garage on Dave Dixon Dr. will be open April 17 & 18 with the following hourly rates: 0-3hrs $3; 3-4hrs $4; 4-5hrs $6. The expo is FREE and open to the public, and it's where all race participants must pick up their numbers, as there is NO RACE DAY PACKET PICKUP. The hours for the expo are from 10am - 8pm both today, Thursday, April 17th and tomorrow, Friday, April 18th. Both participants picking up their numbers at the expo as well as those who had their numbers mailed to them can pick up their race t-shirt at the Hyatt during the event. In order to pick up your number, bring a Photo ID or driver's license. In order to pick up your participant shirt, you much have your bib number with t-shirt claim tab attached. According to the CCC10K website, you may have a substitute pick up your number and t-shirt, but they must have a "photocopy of your ID or your email confirmation for the event." The Health and Fitness Expo features a wide array of vendors and local races showing off what they have to offer, plus special presentations will take center stage throughout the day. For a complete list of scheduled events, click HERE. If you haven't registered yet for the race, there IS still time! Visit the expo during the above hours, and register for $45. The best tip for CCC10K race morning is to be early for everything! The event draws participants of all skill levels, including many who make this their only race of the year. While that makes for a fun and exciting atmosphere for all participants, it also brings a lot of inexperience. Just allow yourself ample time to be where you need to be! There are options for parking on race morning. There is limited FREE parking available near the finish line at City Park along Marconi Blvd, in Marconi Meadows, and near the Dog Park. Parking on the neutral ground along Marconi Blvd. is illegal. You will be towed. Additionally, Delgado has agreed to provide secure race day parking to participants in the lots on their campus for $20. Should you decide to have your car waiting for you at the finish, there is bus transportation provided to the start beginning at 5:30am. The line to board a bus will not be hard to spot, as it will be near the entrance to Tad Gormley Stadium. Bus service from the finish area to the start will conclude at 7:45am. Arrive BEFORE 7:30am to catch the last buses to the start. If you want to avoid the pre-race bus lines and park at the start, there is parking available downtown. Garage 6 at the Mercedes-Benz Superdome will be open and accessible from the Poydras/Superdome exit from I-10; parking will be $5 - cash only. There will also be parking for $8 at 1301 Girod Street garage for race participants on Saturday (up to 6 hrs; must have bib # as proof). Race organizers provide complimentary bus service from 10am until 1pm to return participants back downtown after the event. The starting line is situated conveniently at the corner of Poydras Street and Loyola Avenue in downtown New Orleans. You'll line up in the shadows of the Mercedes-Benz Superdome, and plenty of signage will direct you where to go. Your race bib number is color coded to the area in which you are required to line up. Please be conscious of the color of your bib, and line up in the appropriate corral. Seeded (faster runners) will be to the front, while walkers and participants with strollers and ice chests will be required to line up in the back. NO EXCEPTIONS. This is for the safety and enjoyment of all participants. This year, in the wake of events at other races around the country, participants are highly discouraged from brining backpacks to the race. If you are running or walking with a bag, stroller or cooler, please prepare for extra time to get to the start area, as security guards WILL be checking ALL bags at the start. Again, any participants with a stroller or cooler will only be allowed entry into the last "yellow" corral. NO bikes, rollerblades, skates, or pets of any kind are allowed on the course. 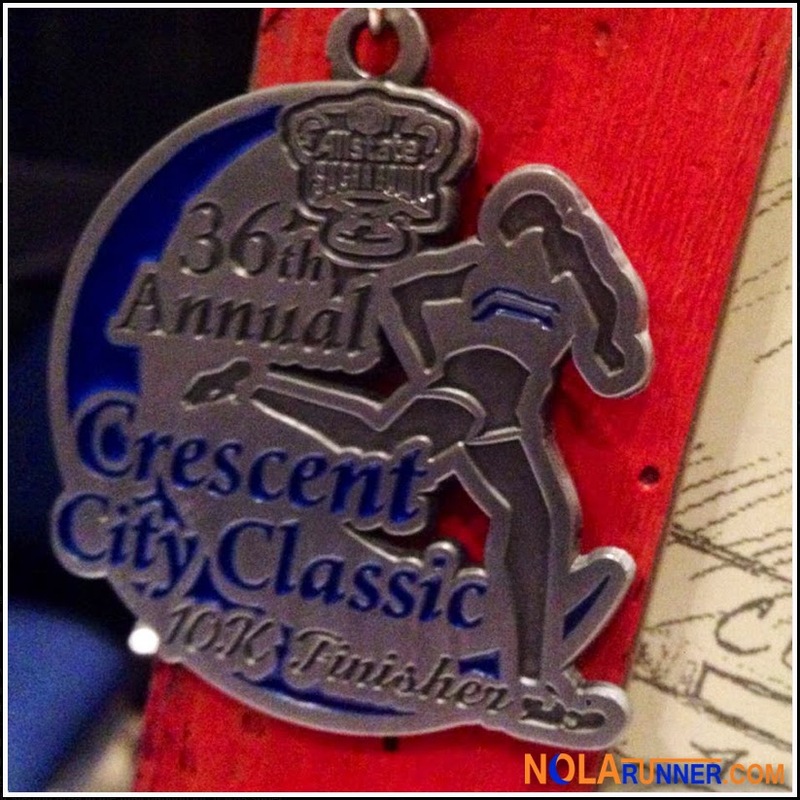 The Allstate Sugar Bowl Crescent City Classic 10K is a fast point-to-point race. You'll run down Poydras Street toward the Mississippi River, turn left on to South Peters which flows on to Decatur Street. After passing in front of Jackson Square and the French Market, runners turn left on to Esplanade Avenue and head toward City Park. After a final winding stretch through City Park, finishers cross the line under the oaks of Roosevelt Mall. Water stations will be at each mile marker along with restroom facilities. STAY HYDRATED on race day. After crossing the finish line, participants will receive their Finisher Medal (which I first revealed back in January) and Kentwood Springs water. All participants are invited to stay and enjoy the post race festival in City Park from 8:30am - 1pm. Entrance is free with a bib number, and non-participating family and friends can purchase a $5 ticket to attend (available at the gate and the expo). Music throughout the morning will be provided by Bonerama & Big Sam's Funky Nation, plus Blue Runner will be dishing up their signature Red Beans and Jambalaya. Michelob Ultra will also be free flowing next to Kentwood Water and additional fruit and snacks. 8:00 am - The Allstate Sugar Bowl Crescent City Classic Begins! 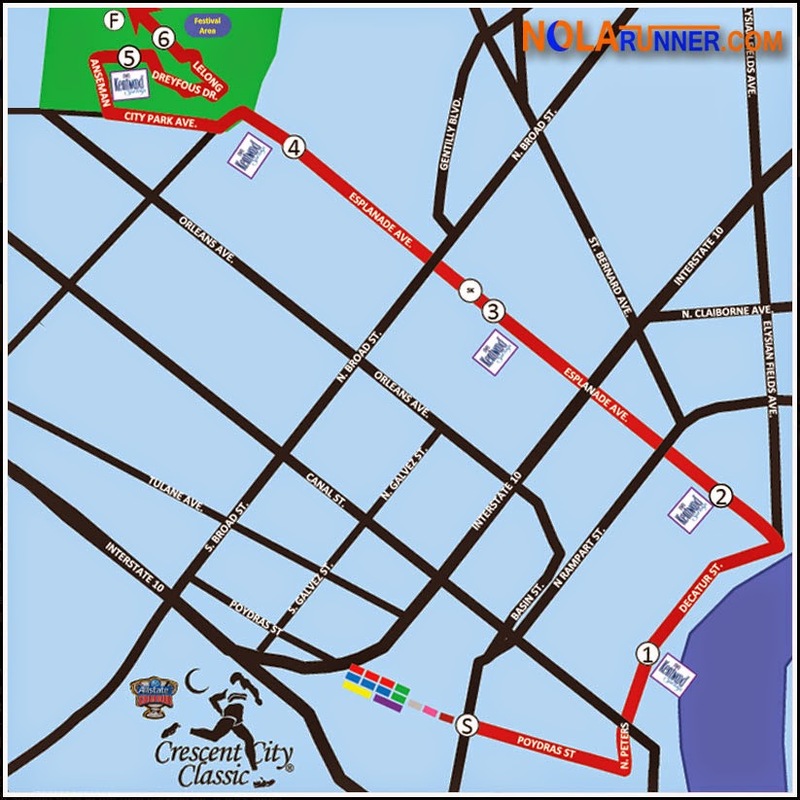 10:00 am - FREE Bus Transportation begins taking participants back downtown to Poydras St.
All information in this post, along with some pictures came from the All State Sugar Bowl Crescent City Classic 10K website (www.CCC10K.com) or Facebook Page. If you have any questions, feel free to comment below or check out their sites for more details.